Growing vegetables is a wonderful pastime and a well-tended garden is able to bestow its gifts for many months. Each day of harvest is like getting fresh-food presents and growing a tuber or root crops just adds to the excitement. The plants become large and vibrant, yet the actual fruit of the plant remains a mystery until dug or pulled out of the garden soil. 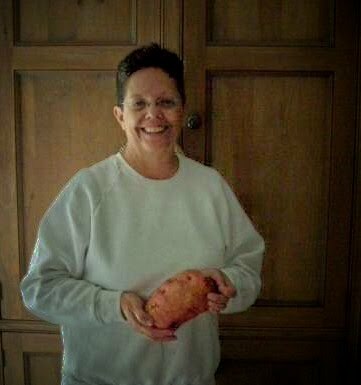 In my garden, sweet potatoes were one of my favorite 'hidden' crops...no matter how many I pulled out, I was certain to miss some...it was like a treasure hunt for grown-ups. 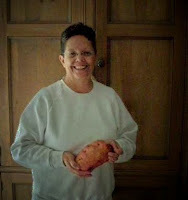 While harvesting is fun, using those sweet potatoes can be a challenge. They do not have the long shelf-life that are inherent to real potatoes and have to be dealt with in a timely manner. Most of my background in eating and serving sweet potatoes used to be relegated to the marshmallow-topped dish typically served withThanksgiving or Christmas dinners. I had not really thought much beyond that recipe until I had deal with my garden abundance. Luckily, I discovered that sweet potatoes make a wonderful side dish when baked in the oven and served with butter and a little salt. I was even more thrilled when I figured out that they could be cooked very easily and with great results in the microwave. Still, one can only eat so many baked potates. 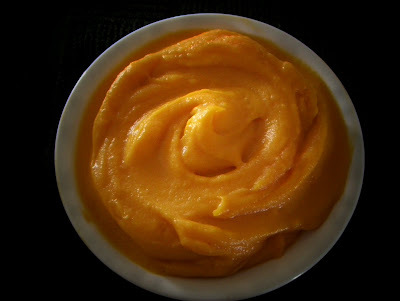 Today's whipped sweet potato recipe was inspired by my sweet potato bumper crop...it is so wonderful that it is almost the only way any of us in my family now want to eat these orange roots. Note: when whipped, sweet potatoes freeze very well and can be vacuum-sealed for use months later. Wash and dry the amount of sweet potatoes to be used. Wrap them individually in paper towels and put them, one at a time, into a quilted baking bag for the microwave. It only takes 4-6 minutes to cook one to perfect tenderness. Allow to cool slightly and peel off the skin. *Cut the flesh into 3-4 chunks and place in a food processer or Vita Mix. Add 2-3 T margarine or butter and 2-3 T brown sugar. Process until smooth and creamy. Remove to a serving dish and proceed with the remaining potatoes. Salt if desired. These may be served immediately, covered and refrigerated and reheated for later use or frozen and vacuum sealed as mentioned above. Note: search potato microwave bags - you will find many sources where the bags may be purchased on-line as well as directions to make your own. Be sure to use bags as directed. Alternate cooking method: Peel potatoes, put in a large pot of water, cover and boil until tender. Remove and follow directions above from*.